Put simply, the apparatus for HAARP is a reversal of a radio telescope: antennas send out signals instead of receiving. HAARP is the test run for a superpowerful radio-wave beaming technology that lifts areas of the ionosphere by focusing a beam and heating those areas. Electromagnetic waves then bounce back onto Earth and penetrate everything � living and dead. 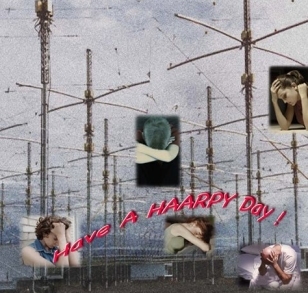 HAARP publicity gives the impression that the High-frequency Active Auroral Research Project is mainly an academic project with the goal of changing the ionosphere to improve communications for our own good. However, other U.S. military documents put it more clearly: HAARP aims to learn how to "exploit the ionosphere for Department of Defense purposes." Communicating with submarines is only one of those purposes.